Cardiac resynchronization therapy (CRT) is a recommended treatment in patients with electrical dyssynchrony such as left bundle branch block (LBBB). The determination of the optimal leads position, and the quantification of the changes in electrical activation are two current major challenges. In this paper, we investigate these aspects through electroanatomical data from a controlled experimental protocol, which studied pigs with no structural disease under LBBB and CRT conditions. 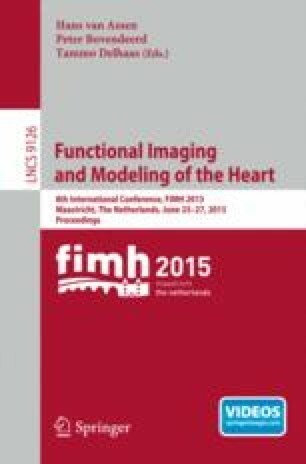 We propose to use a quasi-conformal mapping technique to standardize electroanatomical maps of endo- and epi-cardial walls of both ventricles to a common reference geometry, in which simple quantitative indices can be computed. Then, we investigate the relation between leads and simple surrogates of the recovery of the electrical activation based either on total activation times or on the spatial distribution of the patterns. Our methodology allows a better understanding of the complex electrical activation patterns in LBBB and CRT, and confirms hypotheses about the optimal leads position from previous studies. This study was partially founded by the Spanish Ministry of Science and Innovation (TIN2011-28067) and the Spanish Industrial and Technological Development Center (cvREMOD-CEN-20091044). The authors gratefully acknowledge the support of N Solanes, M Rigol, E Silva, A Doltra, L Gabrielli, L Mont, J Brugada (Hospital Clnic, Barcelona, Spain) and A Barcelo (Sorin Group, Barcelona, Spain) on the experimental protocol.